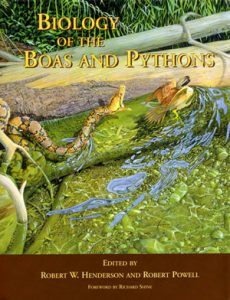 This book is the product of a symposium “Biology of Boas, Pythons, and Related Taxa” held at the 2005 joint meetings in Tampa, Florida, and sponsored by the Society for the Study of Amphibians and Reptiles. This was the first attempt to bring together researchers actively working on some aspect of boa/python biology. The symposium was a resounding success, and this book represents a current assessment of our understanding of boid biology. Between the diversity of the peer-reviewed contributions and the literature reviews, this volume will become an essential reference for most future boa and python research. How do snakes crawl and climb? What do they eat? How do they breathe, hear, and smell? What is the largest snake? Authoritative and accessible, this book answers the most frequently asked questions about snakes and provides a basic introduction for both adults and children to the habits and marvels of these limbless creatures. Nearly 160 illustrations, 55 in colour. 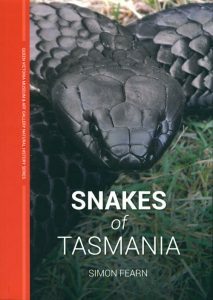 Having been passionate about snakes all his life, Fearn’s experience, knowledge and understanding are enthusiastically shared in this book, providing a fascinating insight into the biology and habits of Tasmania’s three venomous snakes. Illustrated by full colour photographs this comprehensive guide will teach you how to identify, appreciate and live alongside these often feared creatures. 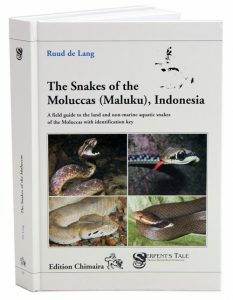 The Snakes of the Moluccas (Maluku), Indonesia: A Field Guide to the Land and Non-Marine Aquatic Snakes of the Moluccas with Identification Key. Provides details of all 49 snake species (plus the enigmatic genus Acantophis, of which the number of species has not yet been established) found on the Moluccas. The species descriptions cover external morphology, colour, habits, habitat and distribution, and serve to identify specimens in an easy way. It presents a key (in English and Bahasa Indonesian) to easily identify specimens. 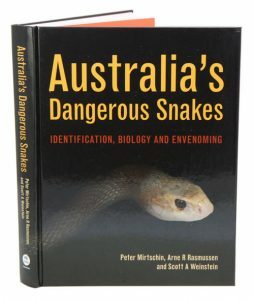 With contributions from many Australian herpetologists, this book contains a lot of overlap with Australia’s fauna. 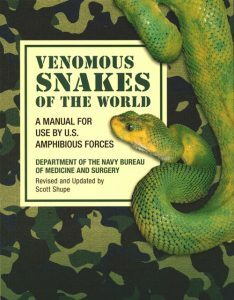 Venomous snakes of the world: a manual for use by U.S. amphibious forces. 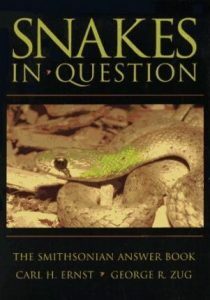 Originally published in 1962, this is the perfect practical guide to not only snake bite survival, but to understanding and identifying venomous snakes. Even if no life hangs in the balance, this manual is a great reference guide for the outdoors enthusiast, the reptile lover, or anyone with a thirst for pragmatic, how-to knowledge. 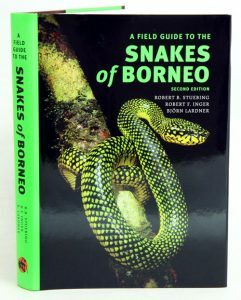 With this comprehensive edition, you will be armed with one of the most thorough volumes available for dealing with these incredible reptiles, including definitive advice on: Precautions to avoid snake bites, identifying the symptoms and signs of snake venom poisoning, first-aid and medical treatments, recognizing poisonous snakes and indigenous species from various regions around the world. Completely revised and updates this new edition is now in full colour making for the easiest identification yet. Artist/Author: Wallach, Van et al. This title is not held in stock but we are happy to supply on special order. Please contact us. 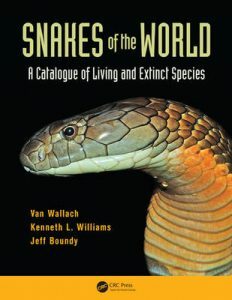 This book covers all living snakes and fossil snakes. It has broad appeal not only to conservationists and herpetologists but to hobbyists, educators and libraries and it will be the standard reference on snakes. The text includes 1) 625 valid genera and 3800 valid species (including their synonyms), 2) dubious names (12 genera and 155 species), and 3) invalid names (19 genera and 151 species). The index lists every species in two ways (genus-species and species, genus) so any name can be easily found. Also available in paperback [stock id 39745]. 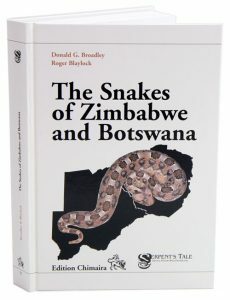 Snakes of Zimbabwe and Botswana. Artist/Author: Broadley, Donald G. and Roger Blaylock. Frankfurt Contributions to Natural History Vol. 39. This guide details the 93 species of snakes found in Zimbabwe and Botswana. Species are grouped in families and illustrated with multiple colour photographs. Each species is accompanied by a distribution map and notes on appearance, range and preferred habitat. 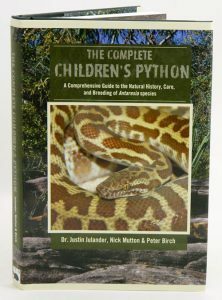 The Complete Children’s Python: A Comprehensive Guide to the Natural History, Care and Breeding of Antaresia Species. Artist/Author: Julander, Justin, Nick Mutton and Peter Birch. The genus Antaresia, a group commonly referred to as the Children’s pythons, can be found across the continent of Australia and part of neighbouring New Guinea. This group contains the smallest pythons in the world. Despite their small size, these snakes are ideally suited to life in the often-harsh climates of their native Australia. Because of their size and durability this group has been very popular among python keepers for many years. This book is dedicated to all aspects of this amazing group of snakes with particular emphasis on natural history, biology, and reproduction. The authors have beautifully illustrated the immense diversity and natural beauty contained within wild populations of these pythons. This group has previously been underrepresented in herpetocultural literature despite being one of the world’s most successful and widespread python genera. A guide to Australian pythons in captivity. 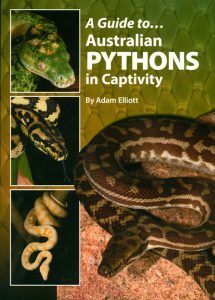 This title is the latest reference dealing with Australian pythons in captivity to be published in Australia. 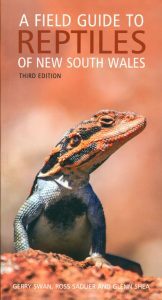 Written by Adam Elliott, with contributing authors, Dr Robert Johnson presenting the Health and Disease chapter, and Dr Justin Julander presenting the Taxonomy, Hybridisation and Morphs sections, the information is aimed at all levels of expertise in reptile keeping and breeding. All aspects regarding the captive care of pythons are covered using accessible text and an easy-to-read layout. More than 400 colour images support details on general management including selection, handling, housing, temperature, thermoregulation, lighting, humidity, feeding-what to feed, nutrition, how to feed and feeding problems.